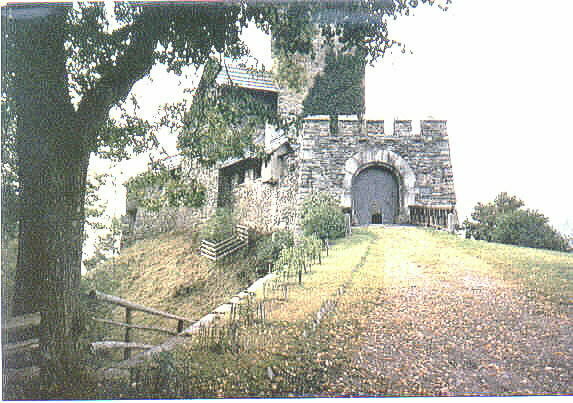 This a view of our castle gate with the massive ivy covered tower in the background. Dies ist ein Blick Tor unserer Burg mit dem massiven Efeu bedecktem Turm im Hintergrund. Burg Jägerhof, our main castle, is built in the foothills of the Olympic Mountains. While medieval in design, appearance, and function, the interior of our castle is quite modern and very comfortable. Some of these modern comforts include the electronic surveillance and security systems, the conservatory and the indoor swimming pool. This page and photographs are copyright protected. Alle Aufnahmen sind geschützten Urheberrecht.